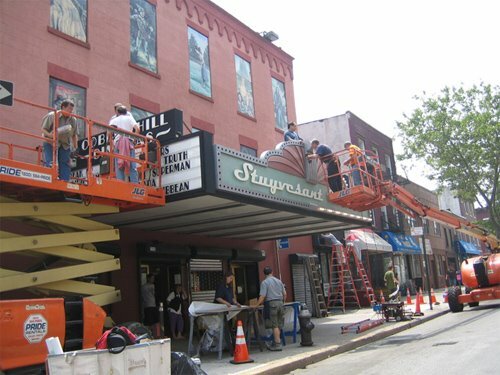 The above is a pic of my little local theater being outdecked for the Spiderman 3 filming that's taken over my neighborhood this week. UPDATE: I just ran to the deli a block from my apartment and there are little blue signs that Spidy's going to be filming. On Monday. One block from my apartment. The block has the St. Mary's Star of the Sea church on it. A wedding perhaps? My deli guy thinks it may be a night scene though. Yes, they are shooting at night. But they are using Night for Day, which means that everything will be lit light the top of the Empire State Building. Shooting that was lessens the crowds, and enables them to close down streets without really screwing up traffic. good to know anon. thanks! your naughty... but I cant wait to find out more! The Hurricane's Coming! The Hurricane's Coming!